Lovely but tough as nails, Lael Click is the daughter of a celebrated frontiersman. Haunted by her father's former captivity with the Shawnee Indians, as well as the secret sins of her family's past, Lael comes of age in the fragile Kentucky settlement her father founded. Though she faces the loss of a childhood love, a dangerous family feud, and the affection of a Shawnee warrior, Lael draws strength from the rugged land she calls home, and from Ma Horn, a distant relative who shows her the healing ways of herbs and roots found in the hills. But the arrival of an outlander doctor threatens her view of the world, God, and herself--and the power of grace and redemption. This epic novel gives readers a glimpse into the simple yet daring lives of the pioneers who first crossed the Appalachians, all through the courageous eyes of a determined young woman. Laura Frantz's debut novel offers a feast for readers of historical fiction and romance lovers alike. - Publisher One woman searches for love--and herself--in a wild land.Lovely and high-spirited, Lael Click is the daughter of a celebrated frontiersman. Haunted by her father's ties to the Shawnee Indians and her family's past, Lael comes of age in the fragile Kentucky settlement her father founded. As she faces the many trials of life on the frontier, Lael draws strength from the rugged land. But the arrival of a handsome doctor threatens her view of her world, her God, and herself. Can the power of grace and redemption break through in this tumultuous place?This epic novel gives you a glimpse into the simple yet daring lives of the pioneers who first crossed the Appalachians, all through the courageous eyes of a determined young woman who would not be defeated. "The Frontiersman's Daughter takes readers along for quite a ride with high-spirited Lael as she searches for love during a time when the world is more savage than civilized, when medicine comes from roots, and when a woman alone needs to keep a gun within reach. Laura Frantz portrays the wild beauty of frontier life, along with its dangers and hardships, in vivid detail." --Ann H. Gabhart, author of The OutsiderLaura Frantz is a former schoolteacher and social worker who credits her 100-year-old grandmother as being the catalyst for her fascination with Kentucky history. Frantz's ancestors followed Daniel Boone into Kentucky in 1792 and settled in Madison County, where her family still resides. Frantz currently lives in the misty woods of Port Angeles, Washington, with her husband and two sons. One woman searches for love--and herself--in a wild land.Lovely and high-spirited, Lael Click is the daughter of a celebrated frontiersman. Haunted by her father's ties to the Shawnee Indians and her family's past, Lael comes of age in the fragile Kentucky settlement her father founded. As she faces the many trials of life on the frontier, Lael draws strength from the rugged land. But the arrival of a handsome doctor threatens her view of her world, her God, and herself. Can the power of grace and redemption break through in this tumultuous place?This epic novel gives you a glimpse into the simple yet daring lives of the pioneers who first crossed the Appalachians, all through the courageous eyes of a determined young woman who would not be defeated. "The Frontiersman's Daughter takes readers along for quite a ride with high-spirited Lael as she searches for love during a time when the world is more savage than civilized, when medicine comes from roots, and when a woman alone needs to keep a gun within reach. Laura Frantz portrays the wild beauty of frontier life, along with its dangers and hardships, in vivid detail." --Ann H. Gabhart, author of The OutsiderLaura Frantz is a former schoolteacher and social worker who credits her 100-year-old grandmother as being the catalyst for her fascination with Kentucky history. Frantz's ancestors followed Daniel Boone into Kentucky in 1792 and settled in Madison County, where her family still resides. Frantz currently lives in the misty woods of Port Angeles, Washington, with her husband and two sons. Laura Frantz credits her 100-year-old grandmother as being the catalyst for her fascination with Kentucky history. Frantz's family followed Daniel Boone into Kentucky in 1792 and settled in Madison County where her family still resides. Frantz is a former schoolteacher and social worker who currently lives in the misty woods of Washington state with her husband and two sons, whom she homeschools. 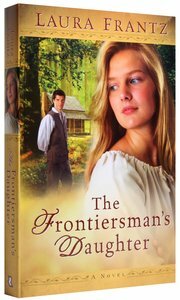 Customer Reviews For "The Frontiersman's Daughter"
This very long (epic=400 pages!) book started off very slowly. It is the story of Lael Click, daughter of one of the first frontiersmen to settle beyond the Appalachians. It starts when Lael is 13 years old, and although they married young in those days, I found it almost impossible to relate to the feelings for men that are attributed to such a young girl. I appreciated the way she honored her father throughout her life, and enjoyed it all much more once she was grown up, growing closer to God, and being courted by a strong Christian doctor. Laura Frantz writes very descriptively, and I enjoyed the way she gave both sides of the whiteIndian clash. So it has good points and bad, was a bit long, but all in all an interesting novel. I thorougly enjoyed this book, was a good length and lasted a few good nights of reading!! (one of those books that you spent every spare moment reading!) I skipped to the end to see what happened and almost cried because of what happened, but at the end i was on his side ;) It's historical and I really "got into" the old-fashioned way of life, and the native people, and it's pretty romantic too :) I advise this book to...anybody! I just really really enjoyed it, 5 star! !